The MS6 adds six stereo returns to any system. 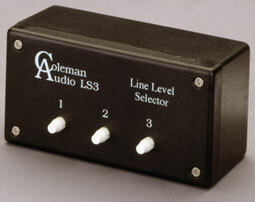 This model incorporates completely passive switching and XLR connections for all inputs and outputs. Utilizing active balanced circuitry to preserve signal-to-noise ratio and avoid loading or signal loss, the MS6A also has a separate headphone output with independent level control for direct monitoring and a mono switch to check phase compatibility. This model incorporates XLR connections for all inputs and outputs. The MS8A follows with all the features of the MS6A, and improves the series by increasing the number of switchable sources to eight, and adding an additonal passive fixed level stereo output. This path is perfect for metering or a tape feed. A mono switch allows you to check phase compatibility of a stereo source and the left input only provides mono on all ouputs. This model incorporates ¼" TRS connections for all inputs and outputs. The PS1A provides switching and monitoring control for up to four stereo devices. Easy comparison of input and output of any recording medium. This unit provides a variable level monitor output and two additional fixed outputs for metering, cue feed or master record path (ie; DAT, CD-R, or even linear magnetic media, aka... tape!). The mono switch allows you to check phase compatibility of a stereo source and only feeds the monitor ouput. All connections are via XLR. The SPK5+1 provides switching for five stereo outputs and one stereo sub output from a single stereo input. The sub woofer output is always on unless the sub mute switch is pushed. This allows multiple stereo speakers to be selected with or without the sub woofer. All switching is completely passive.